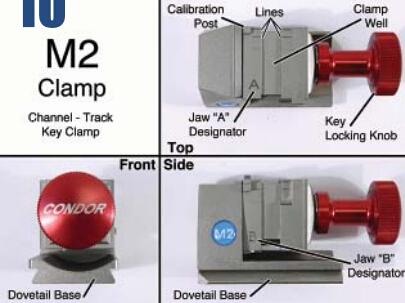 Condor XC-Mini M2 Clamp user manual for newbies… incl what M2 Jaw is, what kind of keys can be used for, how to use M2 Jaw to cut keys with Condor Mini, etc. The M2 Key Clamp has been installed on the Clamp Platform. The M2 Key Clamp is used for all “Channel-Milled” track keys. Toyota Lexus fourtrack inside-milled keys would be an example. Audi, BMW (late), GM and VW side-milled keys are examples of Channel-Milled track keys. There is no Index on this Key Clamp. Slide the fixture into the dovetail socket against the stop pin to locate it. Move the Clamp Locking Lever to the right to lock the fixture in place. The Clamping Knob is rotated clockwise (right) to close the jaws and clamp the key blade. The key is seated in the Key Well for clamping. The Calibration Post is used by the Condor to define and locate the fixture. 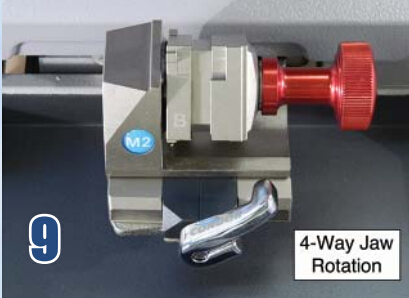 The Clamp Base will disengage and re-engage when the next vise jaw is in position. 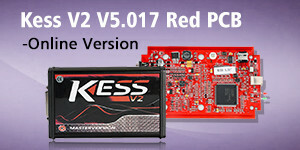 There are four unique vise jaw configurations lettered: A, B, C and D. The correct vise jaw for the key being made will be called out in the display by the Key Data program. 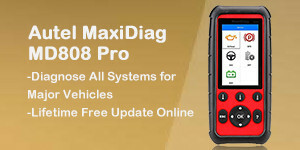 The Condor will detect the position of the Calibration Post, on the Key Vise. This insures that the correct Key Vise is being used for the key being cut. This is another self-check by the machine. The pic details the M2 Clamp for Channel or Track keys. The Front View clearly shows the Dovetail Base. The Top View shows the position of the Calibration Post. (Note that it is even with the rear edge of the fixture.) 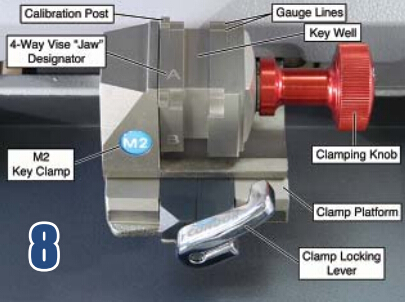 Lines on the Clamp Jaws indicate the desired position of the key tip, as indicated in the set-up procedures of the Key Data step-by-step tutorial. In the Side View we see the “B” Jaw (out of position). Note the position of the Calibration Post. It is about an eighth of an inch back from the edge of the jaw.